One of the most exciting events that we can celebrate is a wedding. And boy, oh boy, is Marcella and Doug's wedding going to be one to top the charts. They are both so genuine, creative, fun, happy, charming, delightful, free spirited, warm, welcoming, personable, kind, caring, tender, thoughtful, and empowering people! Seriously, seeing these two together is a blessing in and of itself. They truly complete each other and their thoughtfulness and love literally spills out onto all those who are fortunate enough to be in their presence at any given time. 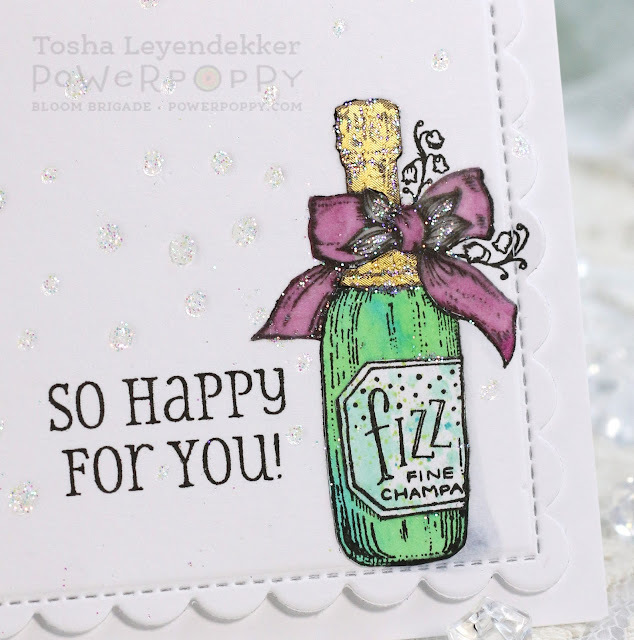 The Power Poppy Design Teams are excited to help in their wedding celebration by putting on a blog hop of the most celebratory kind!! 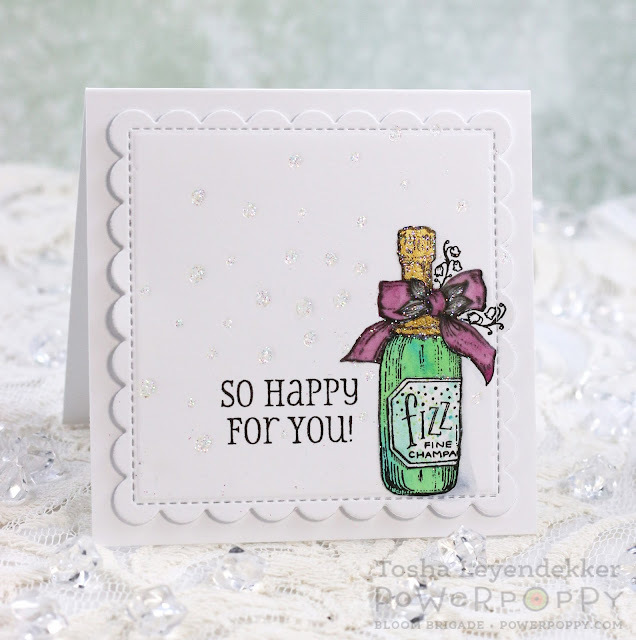 WEDDING CARDS and sweet little congratulatory notes. Marcella and Doug!! I am so happy for the both of you, and am excited to see what God has planned for you together!!! LOVE ya bunches!!! Okay...now for the card... I chose to use the Champagne bottle from Power Poppy's Dream Wedding set because, lets face it, Champagne represents celebration! And Marcella is the most bubbly person I know! In the absolute best ways possible!!! I paper pieced the bottle using some watercolor paper that I colored using Distress Inks. The wrapped top is gold paper, and the bow is vellum that I colored using Copic Markers. Well...that about sums up my Power Poppy Project for today. Be sure to visit all the Bloom Brigade and Instant Gardener Blogs. You won't want to miss a stop, I assure you!! 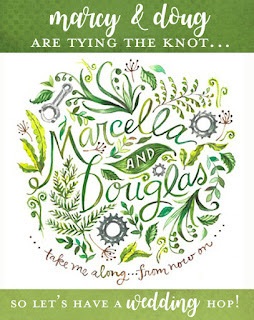 And please, if you are inclined, stop by the Power Poppy Blog to share some sweet Wedding Wishes for Marcella and Doug! Happy Friday!!! I have a Blingy Power Poppy card to share with you today! Boy did I go all glitter crazy!!! I have a lot of vintage ornaments and many of them are pretty sparkly. And pink is quite a Shabby Chic Christmas color. 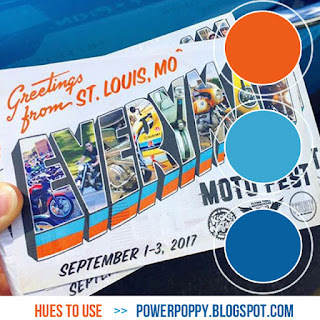 So I thought, why not color up Power Poppy's new Merriest Berries digital image in pink? Oh, yeah!! I kind of wish I would have left the ribbon white. I was going for a silver feel, but I went too dark. *sigh*... but I colored it last, with this being my second attempt, and so...I left it as is. 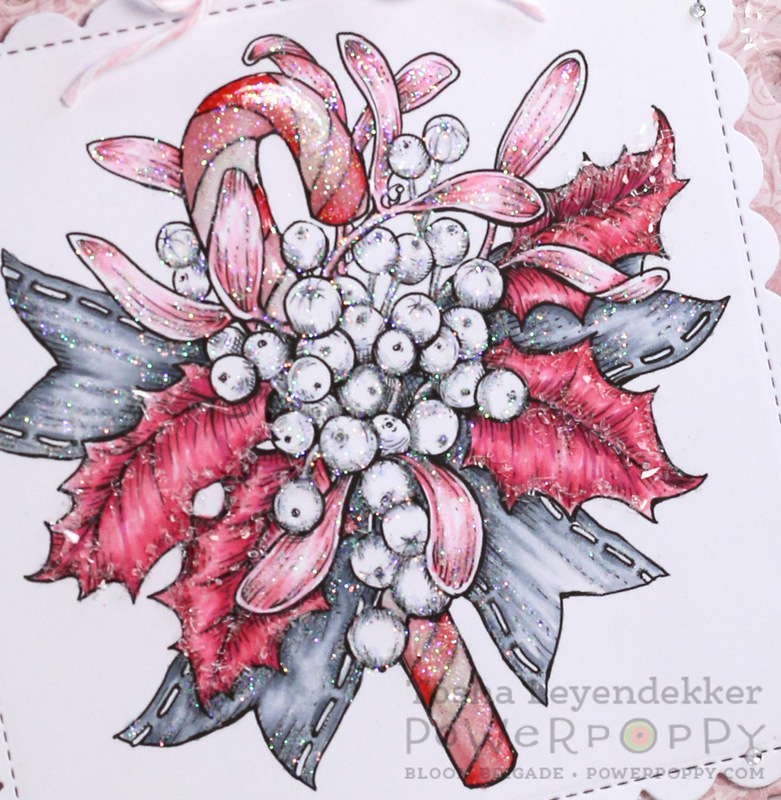 I added Glossy Accents (Ranger) to the candy cane, and then added some Dazzling Diamonds glitter (SU!) to the ribbon, berries and mistletoe leaves while the candy cane was still wet so the glitter would adhere a bit to it too. Lastly, I wanted the large holly leaves to be extra dramatic, so I added some glass glitter to them to really make them stand out. I also added some glass glitter, randomly, to the scroll frame in the background. Here's a close-up so you can REALLY see all the sparkle. I know...I got a bit carried away. But it's super fun irl! That about sums up my card for today!! 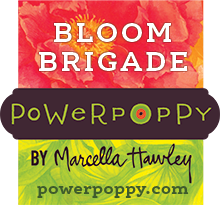 Be sure to stop by the following Bloom Brigade blogs for some more inspiration!! So glad you dropped by!! I hope you have a delightful weekend!! Hello again!! How has your week been? My heart goes out to those suffering from flooding, or hurricane threats. And the fires...well, we're getting the smoke from some, but we're not in any risk other than suffering from allergies because of the poor air quality. So, I'm counting my blessings, and praying for those who are suffering right now. I do have a masculine card to share with you today, that I created by combining two different Power Poppy Clear stamp sets: Short Stacks and Sassy Succulents. I needed a masculine card for my dad's birthday, and I love the packages from the Short Stack set. 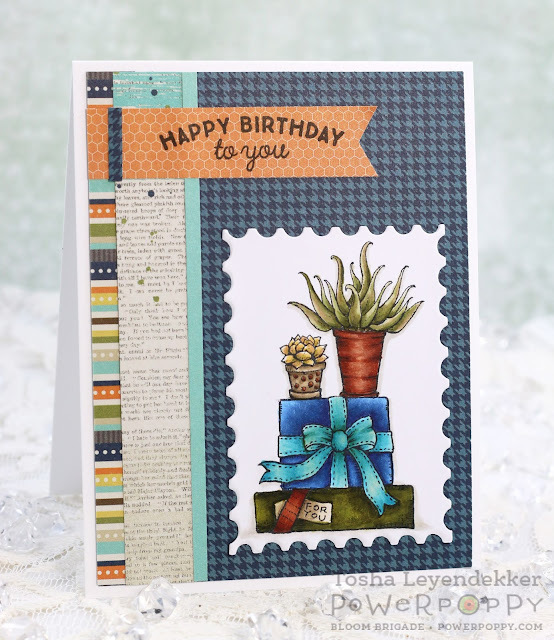 I didn't want to make him a card with tulips and a cupcake though, so I thought, why not add a couple of succulents. So, I got out my Misti, put the clear stamp in it and taped off the tulips and cupcakes with repositionable tape. I inked everything up, removed the tape and stamped the image onto some X-Press It cardstock. So...now I have just two packages. I was able to easily line up the two different succulent pots from the Sassy Succulent set and the end result is what you see above. 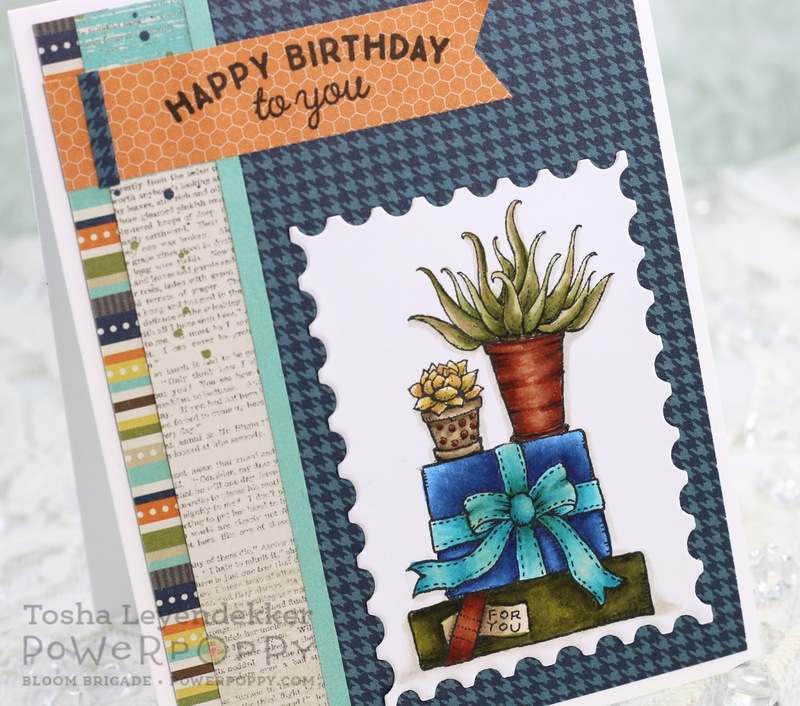 I thought the latest Hues to Use it colors were perfect for a masculine card, so I worked with those colors and used some perfect dp from Simple Stories to highlight it. That's it for my project today. Be sure to check out what the following Bloom Brigaders have to share though...they are always fabulous at inspiring creativity!! Hope you have a wonderful weekend! Thank you so much for dropping by! !